A construction worker at an apartment and retail complex in Nashville. 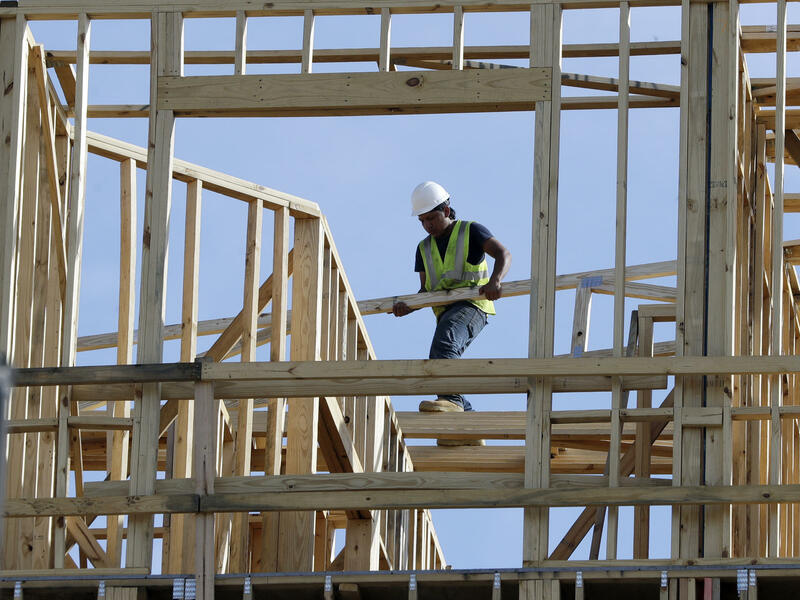 The U.S. economy grew at a less-than-expected 2.6 percent pace in the fourth quarter. The U.S. economy didn't grow as quickly as many economists had hoped, according to numbers released Friday by the Commerce Department. During the final three months of 2017, a closely followed measure of the whole economy, called the gross domestic product, a rose at a 2.6 percent annualized rate. That's reasonably good, but less than the 3.2-percent pace in the third quarter. Most economists had been predicting about 3 percent growth. Treasury Secretary Steven Mnuchin, speaking on CNBC, said the lower-than-expected number was not a sign of a slowing economy. "We're going to see short-term aberrations," he said. "We're not concerned about any one quarter." In the fourth quarter, the biggest part of the economy, consumer spending, did show a lot of bounce. It rose at 3.8 percent, the quickest pace in more than a year. The hurricanes and storms in the third quarter had kept a lot of people at home, so they came out to stores in droves in the fourth quarter. And they got back to work. Personal income increase $178.9 billion in the final quarter of 2017, up from an increase of $112.3 billion in the third. And business equipment investment was growing at the best rate in three years. But elsewhere in the economy, the expansion was slower as the year wound down. Trade and inventory depletion were drags. The economy grew at 3.2 percent in the third quarter and 3.1 percent in the second quarter. So that raised hopes that the country might clock the longest streak of 3 percent-or-higher growth since 2005 — before the Great Recession hit. But the slower-than-expected fourth quarter dashed those hopes. For all of 2017, the economy grew 2.3 percent — up from 1.5 percent in 2016, the report said.